The Sun is an enormous source of energy. One method of using solar power as a resource is to utilize it for electric equipment power supply. For such purposes, the solar panels (also known as the photoelectric converters, solar units, photovoltage converters, etc) are ideal. The solar panels energized by the sun make it possible to receive electric energy. Thus, we offer a measuring system with solar energy conversion to electric energy for smart sensors power supply. While previously a power supply unit had to be used for power supply to the interface converters and smart sensors, now it is possible to use the solar energy to generate electricity, an eternal engine, so to say. Let us look at the presented automated system: it uses a solar panel for receiving the light and heat from the sun, 10 A battery charge current controller and a battery, primary and smart sensors, interface converters, and a PC. The battery charge controller controls the solar panel current. The battery accumulates the energy for its subsequent use at night or in cloudy weather. Depending on the selected battery capacity, the duration of the system offline operation may be extended. So, how does all this work? The solar panel receives solar power from the sun, then, using the controller, the energy is converted into electric energy and accumulated by the battery. The accumulated energy allows the measuring system to function at any time of day, even if no power supply sources are available. 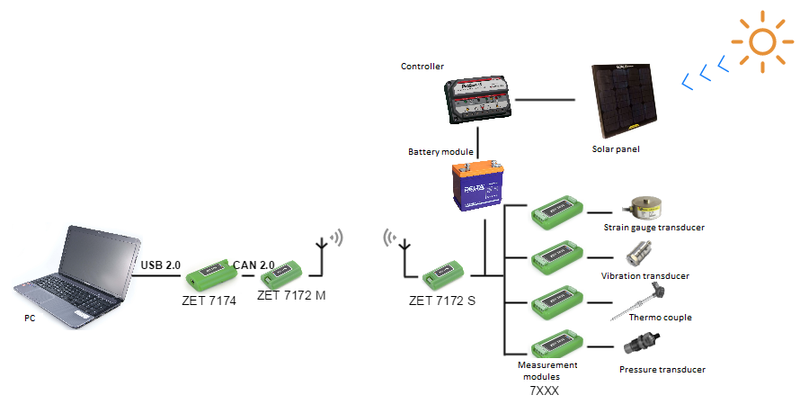 Thanks to smart sensors (ZET 7172S(M), ZET 7176 and 7177), the measuring part of the control system can be moved rather far from the ARM and the servers. For instance, the ZET 7172 interface converter allows to transmit data to a PC from the distance of 20-30 m, the ZET 7176 smart sensor sends data via Wi-Fi 200 m around, while the ZET 7177 GSM converter works within the coverage area of the base stations. You can build any control system using our solar panels and smart sensors.